The Aboriginal Heritage Office receives many queries on Aboriginal words, place names, languages, and clan groups both from Councils and the general public. The number of queries is increasing perhaps at least in part because some intending to give Acknowledgement of Country want to know which clan or group they should use. It is believed that it also reflects an increase in interest in the Aboriginal heritage and culture of the district. Such queries are always problematic because the inquirer usually expects a concrete definitive answer. 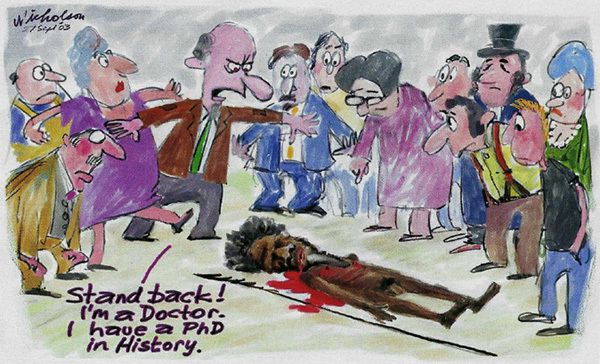 To date the AHO has relied mainly on the extensive review of Aboriginal Sydney by Dr Val Attenbrow (see our Reading List) who compiled from archival sources what was recorded of the Aboriginal clans including the various names, spellings and geographical locations. The AHO realised there were issues with some of the names being used, also raised by Dr Attenbrow, and attempted to inform the inquirers of this uncertainty. The AHO decided it was time to review the current understanding to provide a more informed response for the future. This report focuses on the origin, validity and use of ‘Guringai’ but refers to the broader issue of names of languages and clans in the Sydney area. 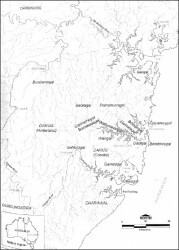 Much of the published discussion to date has centred on the nature of the ‘Sydney language’ and its relationships with the neighbouring languages – ‘Dharug’, ‘Dharawal’, ‘Awabakal’. This previous published discussion centred on the land between Botany Bay and Port Jackson. In this report we are focused on the area to the north of Port Jackson where the AHO has responsibilities to its partnering councils. It is unfortunate that the term Guringai has become widely known in northern Sydney and it is understandable that people wish to use it as it is convenient to have a single word to cover the language, tribe/nation, identity and culture of a region. However, it is based on a nineteenth century fiction and the AHO would argue that the use of the term Guringai or any of its various spellings such as Kuringgai is not warranted given its origin and previous use. It is not authentic to the area, it was coined by a non-Aboriginal person and it gives a misleading impression of the connectivity of some original clan boundaries. It is part of the story of this place that there is no certainty over tribal names, language groups or dreaming stories …” (p.40-41).